We have a moment and a lifetime. A lifetime is a collection of moments, we all know and we all live life like that. Greatness comes to those who live every moment as a lifetime. These are the kind of thoughts brought to our mind by the title ‘Ek Pal ki Umr Lekar’ (Having a moment’s lifetime). 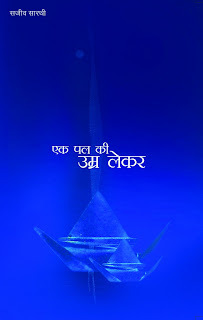 Sajeev Sarathie in his maiden collection of poetry in Hindi entitled ‘Ek Pal ki Umr Lekar’ has tried to sum up the whole life in few words. Moreover, doing so in a language other than one’s mother tongue adds to the stature of success. Born in a small town of Kerela, Sajeev Sarathie went on to carve out a niche for himself in the literary world of our national language, Hindi. The themes of his poetry consist of varied shades that we experience from birth till death. An aura that pervades a majority of his poems is that of nostalgia longing. Very beautifully the poet tries to contain in his words the bubbling childhood in his poem ‘Ek Yaad’. When he talks of the journey of child going to his village school and coming back home. A noticeable feature of his poetry is the use of the technique of alliteration. Quite a few poems in his anthology exhibit the trait of having a number of lines beginning with the same word. 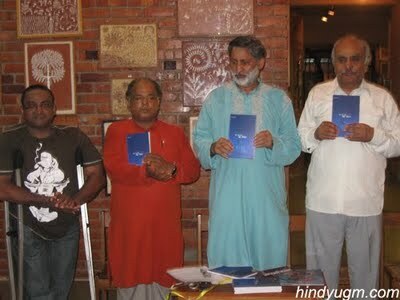 In all this collection of poems and ghazals is unique in the fact that a Keralite has woven a poetic yarn so beautifully in Hindi. Going through the poems one can feel the emotions and feelings of the poet looking at you from behind a line or glancing at you through a word.